A rescue team search for more victims from the scene of a building, which collapsed at Itafaji on the Lagos Island (file photo). 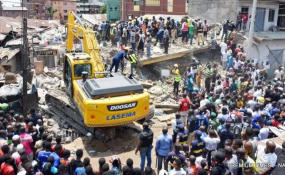 Another two-storey building on Monday reportedly collapsed along Kakawa street, Lagos Island leaving a yet to be ascertained number of persons trapped. The latest incident is coming barely a week after a similar incident occurred which claimed the lives of about 10 persons and 38 others injured. The Lagos state government had marked some old houses in the area for demolition after public outcry. Meanwhile, the Lagos State Management Agency (LASEMA) said no one was trapped in the rubbles. Security operatives and emergency workers have arrived the scene to ensure others residents are safe and ensure that the rubbles are disposed properly.